On this Martin Luther King, Jr. holiday, I love to join service efforts in my local community AND I’m always fascinated to dig deeper into the treasure of words and wisdom Dr. King shared. These inevitably go far beyond “I Have a Dream,” to reveal complex thinking, scholarship, and resolve, each at a remarkably profound level. This year I discovered his Life’s Blueprint speech. It was delivered to Junior High students in Philadelphia, only six months before his assassination. This means that he took the time from his extremely demanding and in-demand schedule to speak to middle schoolers, an often overlooked age group, to emphasize their vital role in building the future, to honor their potential and nobility, and help them see their own worthiness. 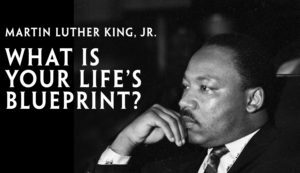 I’m particularly struck how close Dr. King’s Blueprint is to the Junior Youth Spiritual Empowerment program, which is available today, all over the world as small community groups open to young people from any faith background, level of means, or ability. Here’s a link to the full, 20-minute speech.